With a driving modified steppers rhythm and a smooth organ line, the title track to Fortunate Youth's second full length album, "It's All A Jam," pulled me in from the start. My head bobbing and heart pumping, the second track, "Till the End" slowed it down a bit and brought me that irie feeling so common when listening to FY, making me want to reach for my woman and something to smoke on. The brothers, Jered & Corey Draskovich, trade off brief solos in the middle of the track and come together in brotherhood at the end to lead back into a "riddim" section, over which Dan Kelley sings the chorus. Track #3, "One Love" comes at you with a very catchy hook. The song's title lyrics accented by the snare and a crash each time brings the phrase almost outside of the rest of the song. It's definitely one of stand-out songs on the album for me. Mooglude is a brief minute-and-a-half instrumental, blending an organ melody over several moog synth sounds all brought together in a dub style with a steady piano bang over top of it. It is an interesting and mellow musical interlude indeed. I can't help but comment on Track #5, "Ali's Song" as well. Quite likely my favorite track on the album because of the musical variation within, it comes out hard with a crashing, dancehall-style mix into a bubbling verse, then into a pre-chorus featuring a couple of perfect breaks. The chorus switches it up into a major-sounding progression with a simple one-drop beat behind it. Jordan, the drummer, brings some interesting rhythms to the song and his energy translates well. The Vibrations Dub brings a bit of a spacey, mellow mood to the album. The effects on the sax stands out and gives the track a very open feeling. Track 10 is an uplifting, positive song entitled ""Peace, Love and Unity" featuring a verse by Zion Thompson of The Green. The next track, "Sweet Sensi" also features guests. Josh Heinrichs, Steffano Lasso of Strictly Roots and Steven Jacobo of Tribal Seeds each bring their own unique voices to the track, adding a vocal variety that is not to be ignored. 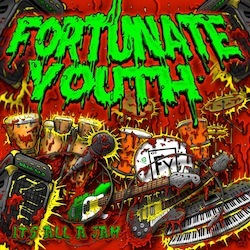 As Fortunate Youth fans, my band-mates and I have been jamming FY's previous releases on the regular. I thoroughly enjoy their first full-length release, Irie State of Mind, from beginning to end and was excited to finally get my hands on this highly anticipated release. I'll be keeping this album in my iPhone on repeat for a while too, I'm sure.